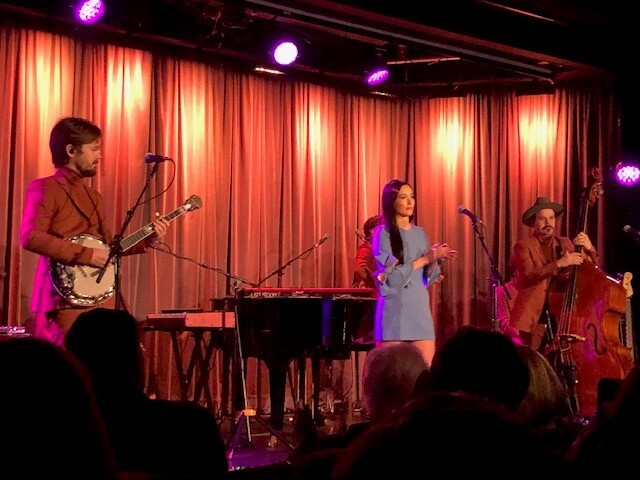 On February 5th (Tuesday), just in time for Grammy week, the 2019 Grammy nominated musician (Album of the Year, Best Country Album, Best Country Solo Performance and Best Country Song), Kacey Musgraves was the star of a special benefit at the Grammy Museum in downtown Los Angeles. Entitled “An Evening With Kacey Musgraves,” the singer sat down inside the Clive Davis Theatre with the museum’s Executive Director, Scott Goldman to discuss her Grammy-nominated 2018 album, “Golden Hour” (MCA Nashville) and much more. This intimate interview and follow-up performance was enlightening and truly eye-opening for Musgraves fans. For about an hour, the singer opened up to Goldman all about the creation of “Golden Hour,” being a female artist in the Nashville music scene, embracing the LGBTQ community and what it means to her to be nominated once again this year for Grammys. She spoke candidly about recording the album in Sheryl Crow’s personal recording studio outside of Nashville and how that freedom and flexibility affected the music-making process for her. After the Q&A was over, Musgraves and her six-piece band took to the stage to perform a few tracks off “Golden Hour,” including a rousing rendition of “High Horse,” “Slow Burn,” “Oh What a World” and “Mother.” Before singing “Butterflies,” she told the sold-out auditorium that “this is the first song I wrote for the man who is now my husband.” She ended the unforgettable night on “Rainbow” with just a simple piano accompaniment. Kacey Musgraves recently added new dates to her “Oh, What a World” tour. The new leg kicks off in August in Paso Robles, California and ends a month later in New Orleans. Before then, Musgraves will perform at the 2019 Grammy Awards and at Coachella this spring.